The corrosion resistance of fibreglass has resulted in extensive use in the mining industry. Saline cooling water and wet gas streams containing hydrogen sulphide at temperatures up to 130°C are corrosive to many materials but GRP offers longevity and strength in these applications. Subsea cooling water intakes and outfall pipelines and diffusers are also manufactured from GRP, which offers longevity in the saltwater environment. Today the company continues to be a market leader in the use of fibreglass for containment, handling and treatment of corrosive industrial chemicals and gases. In order to provide high performance cost competitive solutions to the diverse needs of industry, we draw upon international expertise where required, which complements our internal skills and proven experience. The result is a unique organisation – one capable of the design, production, supply and installation of equipment which handles corrosive and polluting materials for the needs of the mining industry today, and into the future. 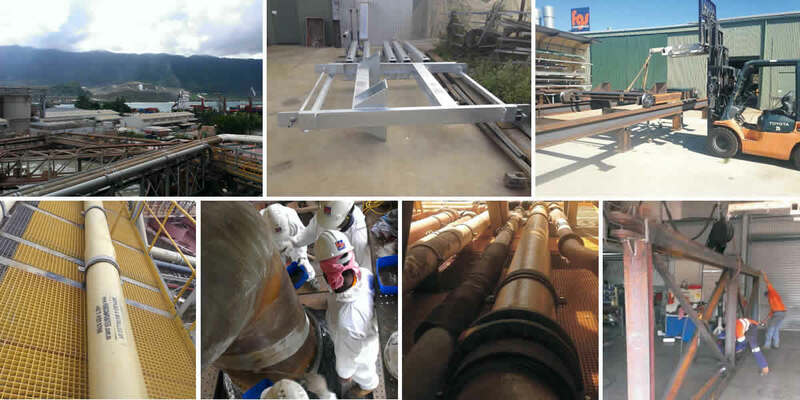 Refurbish and replacement of FRP pipelines, scrubbers, grating and other miscellaneous components. Undertaking innovative procedures to maximise time efficiency during short shutdown timeframes. Fabrication of conveyor stacker structural support and conveyor belt tensioners.